Thanks in large part to their play at the Honda Center, the Anaheim Ducks are picking up some momentum for the postseason. The Ducks will be trying to extend their team-record nine-game home winning streak Tuesday when they face the Los Angeles Kings. Anaheim (43-26-8) has not lost on its own ice since a 4-2 defeat to Dallas on Feb. 15. The Ducks are 25-8-4 at the Honda Center, leaving them one win shy of the franchise mark for home victories set in 2005-06 and matched last season. "If it wasn't for our home record, we wouldn't be sitting where we are right now," center Rob Niedermayer said after Anaheim's latest home win, 5-2 over St. Louis on March 15. The Ducks are returning to Anaheim after a 2-1-0 road trip, capped by Saturday's 2-1 win over Phoenix. Anaheim is in fourth place in the Western Conference and has gone 16-4-1 since Feb. 5. 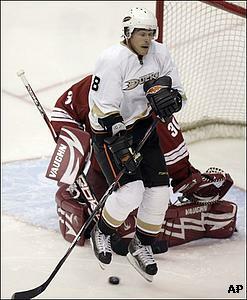 Teemu Selanne scored twice against the Coyotes and has 10 goals and nine assists in 21 games since rejoining the Ducks after contemplating retirement. He moved into 22nd place on the NHL career goals list with 550 and trails No. 21 Johnny Bucyk by six. Rookie Jonas Hiller, meanwhile, made 30 saves in his second straight start in place of Jean-Sebastien Giguere, who sat out with back spasms. "We just ask our goalie to give us a chance to win," coach Randy Carlyle said. "Jonas gave us a strong effort, but to have success, people have to step up and meet the challenge." Hiller made a career-high 41 saves in Friday's 2-1 loss to Pacific Division-leading San Jose. However, Carlyle said that he hopes that Giguere and center Ryan Getzlaf, who missed Saturday's game with an upper-body injury, will be able to go against the Kings. Getzlaf leads the Ducks with 54 assists and 77 points. "Giguere is still having some spasms in his back," Carlyle said Monday. "We don't think it will be an extended period of time. ... With Getzlaf, he skated before practice. We're shooting for Wednesday for both players." Anaheim has won four of its last five against the Kings (30-40-6), but lost 3-1 at Los Angeles in the last meeting Jan. 24. The Ducks have won three straight at home in the series. The Kings own the worst record in the West, but have been relishing their role as spoilers. They've won back-to-back games for the first time since Feb. 5-7, including Saturday's 4-2 victory at Dallas. "Our fate has kind of been written," said defenseman Rob Blake, who had a power-play goal against the Stars. "We're out of the playoffs. We want a little respect, and I think we got that today." Michal Handzus had two goals, including the tying score, and Lubomir Visnovsky picked up the go-ahead goal 55 seconds later. "We look at these games as our playoffs because the games are so meaningful (for opponents)," Kings coach Marc Crawford said. "Dallas wants home ice in the playoffs, and we're using the games to help our young players develop." The Ducks and Kings are both playing the fourth game of their season-ending eight-game stretches against division foes.